The star 2MASS J18082002-5104378 B is part of a binary system together with a companion that’s also of the type called Ultra Metal-poor (UMP) and for this reason the object of a research described in another article published in “The Astrophysical Journal” in January 2016. The interest in what looked like a galactic fossil dating back to the time when the Milky Way formed led to further studies and the star’s wobbling made it possible to discover that actually it was a binary system in which there was a second star with a very small mass and very dim that initially hadn’t been sighted. The analyzes that provide data on the composition of a star and the parameter called in jargon metallicity are important to understand what generation it belongs to. Some time later the Big Bang hydrogen atoms started forming together with a much lower amount of helium and a small amount of lithium. The first stars were typically massive and after a few million years came the first supernovae that spread around heavier elements in a cycle that still continues. Because of the hydrogen concentration that existed when the universe was very young, scientists thought that at the time only massive stars could form. If this were the case, those stars would be impossible to study because they consume their hydrogen at very high rates so none of them close enough to be observed individually would still exist. Studies carried out in the last twenty years have, however, started providing clues to the possibility that even in this remote era sometimes stars of limited mass formed, red dwarfs that consume their hydrogen very slowly and therefore have a life cycle of which 13 billion years are only a small part. The discovery of the star 2MASS J18082002-5104378 B became very interesting, especially when the exams indicated that it’s the most metal-poor discovered so far. The amount of heavy elements it contains was estimated in a mass close to the planet Mercury’s. To make a comparison, a star like the Sun, which has a mass that is about 7 times that of 2MASS J18082002-5104378 B but is much younger, contains an amount of heavy elements that’s about 14 times the planet Jupiter’s. Analyzing the wobbling of the main star of the 2MASS J18082002-5104378 system, Kevin Schlaufman and his collaborators of the Johns Hopkins University, the authors of this research, infered the mass of its companion, which turned out to be only 14% of the Sun’s. It is an ultra-cool dwarf close to the minimum mass limits for a star even if TRAPPIST-1, which became famous in February 2017 for the announcement of the confirmation that its system has 7 rocky planets, is even less massive. 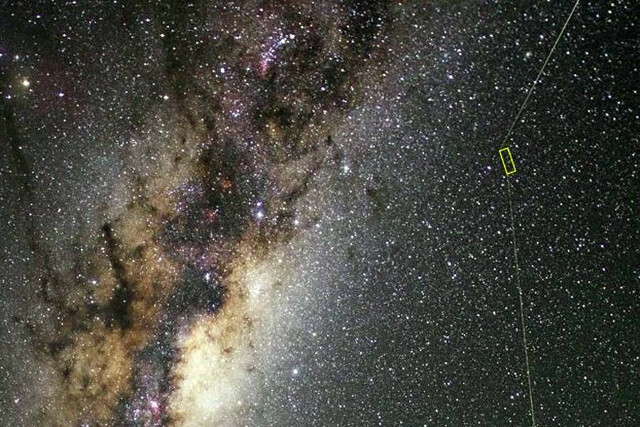 Studying an ancient star such as 2MASS J18082002-5104378 B can provide information on the early stages of the formation of the Milky Way and therefore on a very ancient era of the universe. Its composition indicates that it could belong to the second generation of stars born after the very first supernovae. Knowing that at the time such small stars formed gives us hope that there are still first-generation stars, containing only elements created after the Big Bang: if there were at least one in the Milky Way it would be possible to study an even older fossil of the early universe.